Greenbox Hotel was opened in January 2017. 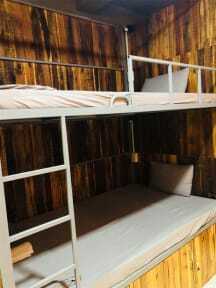 The point is it is clean, clean and clean, we designed 24 single beds, 8 double beds, and 6 bathrooms. In addition, we also have a private room with bathroom inside. With box style design, we look forward to bringing you privacy and convenience while resting. 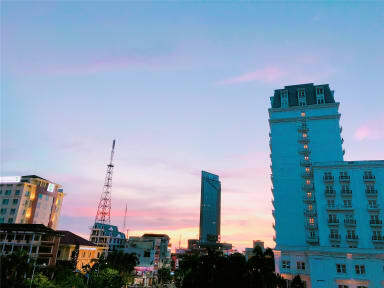 Our hotel is located in the middle of the city of Vientiane and right on the central street. With the motto as a friendly and clean hotel and cheap. We are ready to serve complimentary breakfast to our guests and menu items for lunch and dinner on the hotel. Friendly staff, great location and clean. Couldn’t ask for much more. Nice, quiet and very clean place. However, there were not many backpackers during the time I visited the hostel. So, when you are looking for company, another place could be better. Good place to stay in Vientiane. Steep stairs In the building but these things can’t be helped. Staff are nice guys. Good location to stay. Clean beds and toilets and shower rooms. This is an OK hostel. You simply get what you pay for. Staff and location were ok, breakfast was just toast, coffee/tea. Bed was super hard, and the toilets weren't the cleanest. It's ok for one night. There are some hostels you turn up and immediately know you've made a terrible choice, unfortunately this was for me at Green box. It's a cafe so anyone can walk in and with the dorms not having locks on the door so it wasn't the safest. My capsule felt dirty and the ants I saw crawling around the bed didn't help either. Breakfast was good ( toast and eggs). I personally wouldn't recommend. The beds here were not clean, we had to ask for them to change the sheets and even then they still weren't clean. I also walked in after my shower to find a cleaner next to my bed and when I went to my bed my purse was open and had money missing from it. I should have locked everything away, which was possible but I was only gone for 15 minutes. Location was okay, good size locker under bed and the man who checked me in was nice enough.